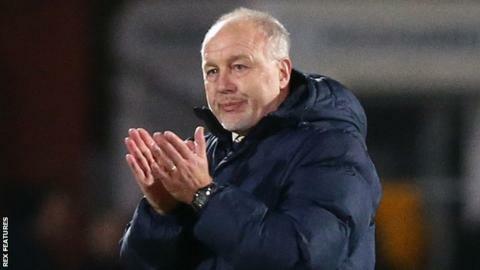 Torquay United boss Gary Owers says his side needs up to 34 more points from their final 21 games to preserve their National League status. The Gulls, who are five points from safety, have won just four games all season and are on 19 points after a last-gasp 1-1 draw with Gateshead. They have eight points from the last five games, their best run this season. "I know how many games we're going to have to win, it's towards nine or 10 games," Owers told BBC Radio Devon. "That's aiming for 50 to 53 points, it might not be that amount at the end, but we don't know at the minute, so we have to set targets that would get us safe going on recent history." Owers, 49, admitted he is irritated by his side making too many bad choices and failing to execute skills properly. "It's really frustrating to watch, the final ball hitting the first man or not greeting off the ground or not delivering at the right time or taking shots on when we're not in the right position to take shots, it's all that," he said. "We see things and it's up to the players to try and improve. It's decision-making and sometimes it's just a lack of quality, the lads need to spend some time practising."